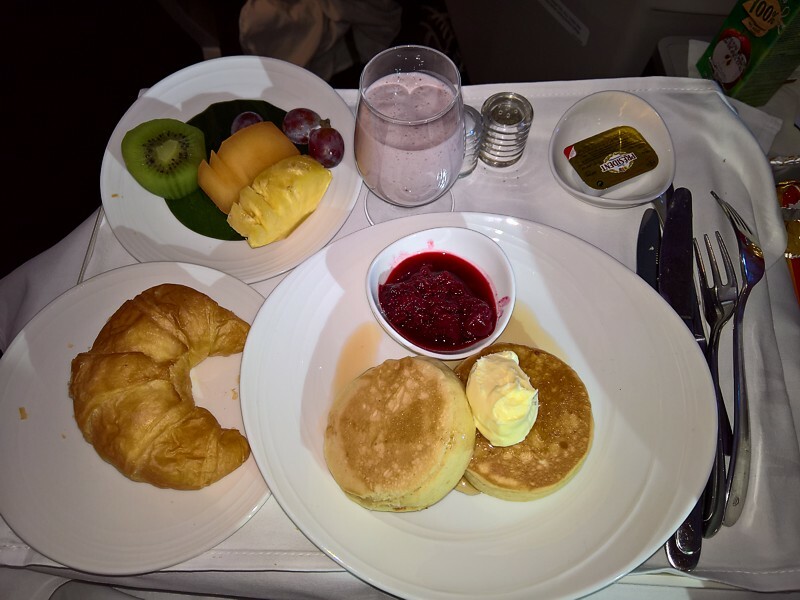 Food on Malaysia Airlines is free, plentyful and just about good. 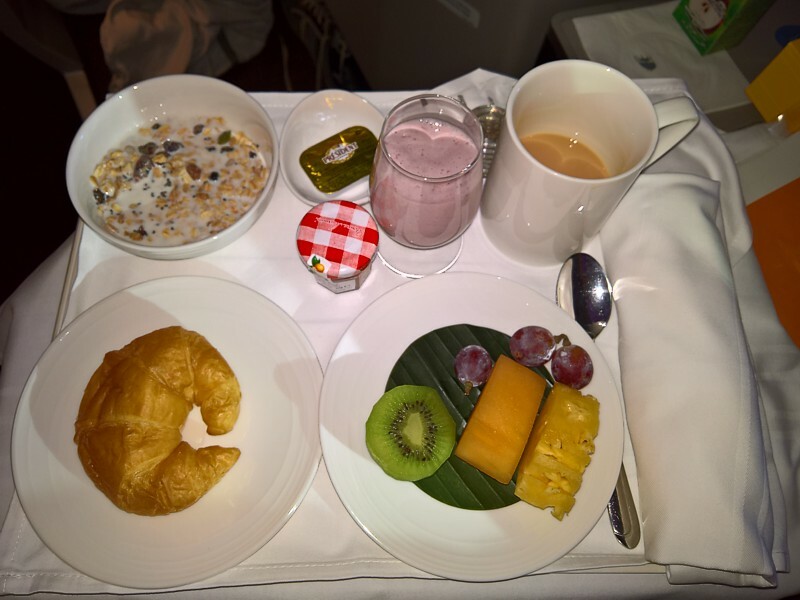 Malaysia Airlines food reviews are often very positive. 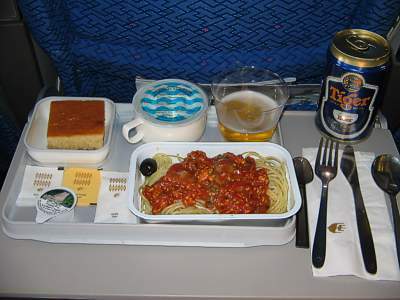 Even on short haul flights you will get a choice of two hot meals, regardless of the time of day. 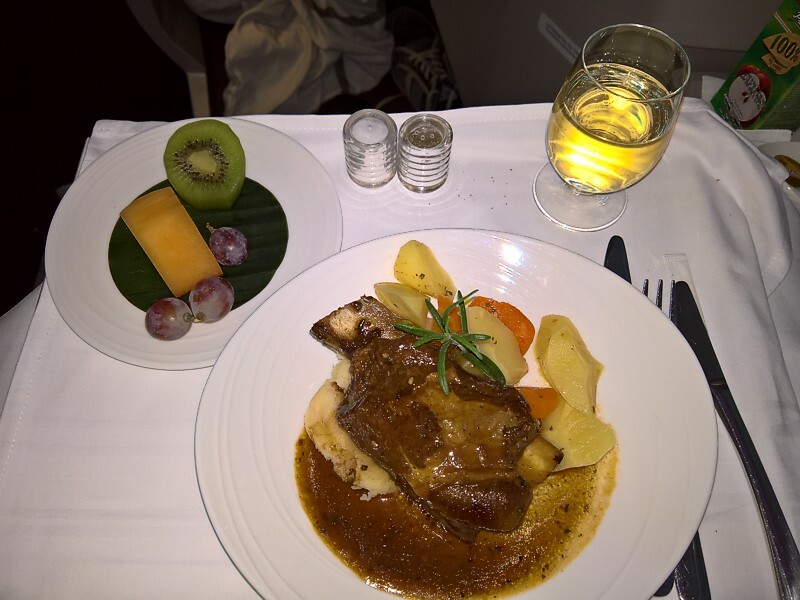 Malaysia Airlines food London to Kuala Lumpur on the A380 is always remarkably good, with three hot choices for both meals. On long flights, there should be three choices, and you get a printed menu, however these are frequently not loaded. Scroll to: Economy, Business, Malaysia Airlines Childrens Meals. 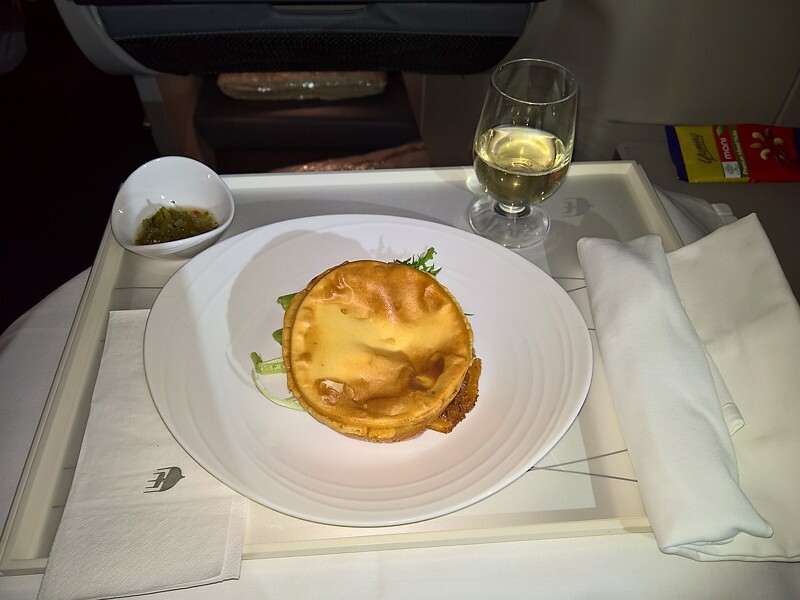 There is a new 'Chef on Call' menu for Business Class on Malaysia Airlines, however it is chaotically implimented. You have to phone Kuala Lumpur to book meals, with the special code for the dish you want - you need to look up the code online. 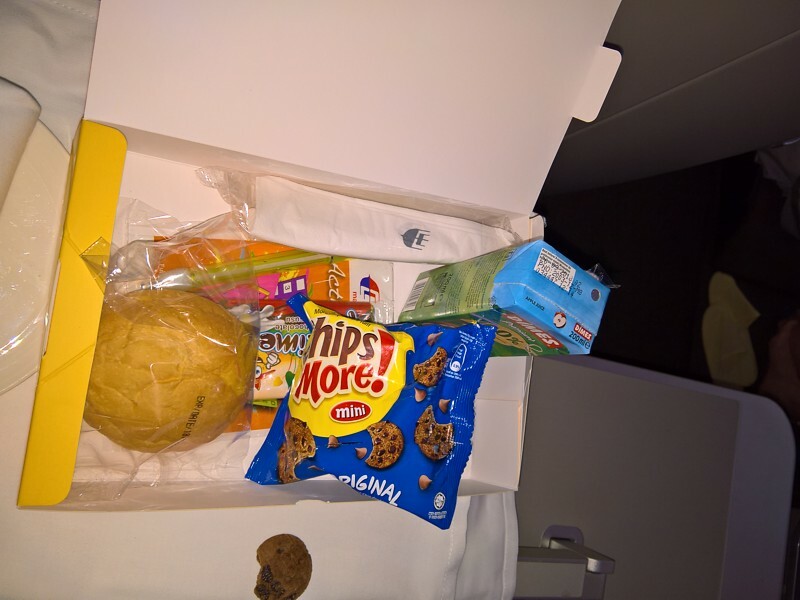 On evening flights, the meals are not served as you leave - all you get is snack. 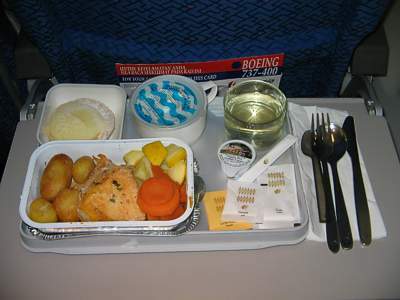 Instead, after breakfast is served, just before landing, your booked meal is brought to you. This means you can get Steak and wine at 8am in the morning, just before landing. Great, it is not. Six chicken Satay skewers, with peanut sauce. This is the only food on board in the evenings from Singapore to Kuala Lumpur. No choice, little quantity. 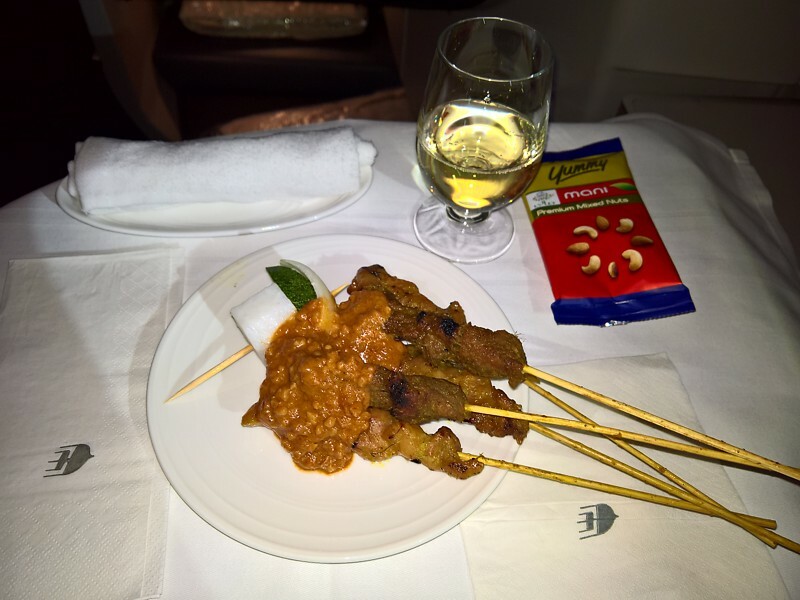 This is the main evening Business Class meal on long haul flights out of KL - amazing. 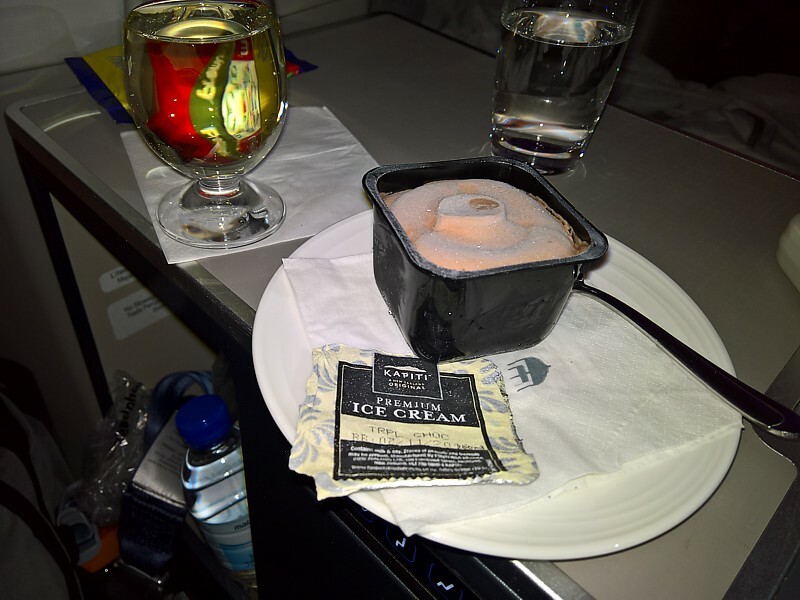 The only evening desert on board, and only offered on request, if you know to ask. You need to know to ask for milk, and for jam from the crosiant. Lamb on the bone, in gravy, with potatoes and carrots. This is the famous Chef on Call booked to order meal. It would be great, if it wasn't served at 8am in the morning! 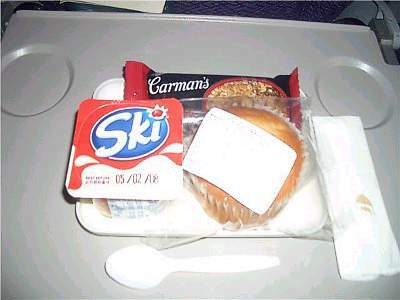 Remember you need to book a Child Meal in advance, or it will not be loaded onto the flight, even if you have a child on your booking. Penne pasta with beef and cheese sauce. Salad with beancurd. A thoughly revolting concotion, with little to recommend it. Odd that Malaysian wrap up their rolls in a plastic wrapper - maybe they don't trust how clean their planes are. Pasta with cheese & tomato sauce, beans, and an unknown fruit. A tub of Salad. A roll. Chocolate bar. I think this picture says it all - don't go for the VLML Veggie option on Malaysian. Even the Salad is basically just a bunch of leaves. After 12 hours on a plane on the way to KL you do kind of expect, well, something. And sure enough, this is what you get two hours before landing. There is really little to recommend here. A tub with heated Spaghetti Bolognese, having a layer of lamb mince and tomato sauce, over spaghetti. One olive. Sponge cake. A tub of water. This is quite a suprise. 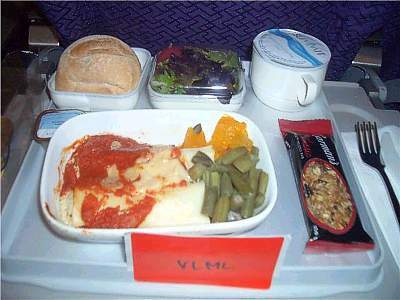 After all it looks like an airline meal from the 80s, and indeed it is. 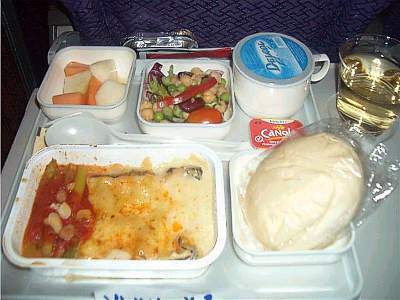 However it is a delight to get not only a hot meal on a short one hour flight, but also a choice. This arrived piping hot, and avoided the normal problem of pasta on planes - that it congeals at the bottom of the tub. I was rather bemused as to the reasoning behind the olive however. The sponge cake desert is a little odd however. It is dry and tasteless. A tub with one heated undertermined part of chicken (with skin) 4 roast potatoes, six slices of carrots, eight chunks of lemon. An apple flan. A tub of water. This is terrible. A really bad dinner, tough, tasteless, and with no flavour. The chicken isn't bad - although it would be nice to assume the chef didn't just slice a chicken into eight bits and then broil it. It has no flavour - but that's not the main problem. The potatoes themselves are unbelievably tough, but as nothing compared to the carrots. They are hard boiled to the stage where no indent can be made on them with the provided knife. But worse is to come. The chunks of lemon. Lemon as a garnish would be fine, but a pile of it? Yuck. The apple flan is however very good - the best bit on the tray.